You’ve conquered bonefish on the flats of Islamorada. You’ve fooled permit in Biscayne Bay. You’ve caught more redfish than you can count on the grass flats of Flamingo. What’s left to accomplish in sight fishing? 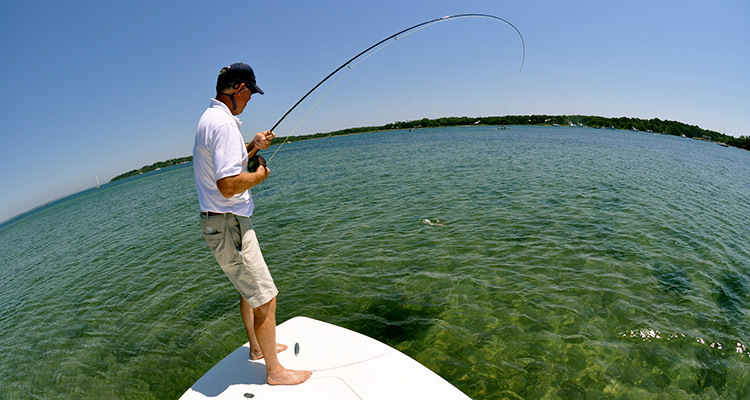 Try scouting the murky mud bottom of the Ten Thousand Islands for snook. Anyone can drift along island beaches, river mouths and mangrove shorelines blind-casting with shrimp, lures and flies in Yoohoo-hued water. By the law of averages, one is bound to hook a fish. But Asaro sets things up so his customers have to see the quarry to cast to it. I wanted to try my luck — not with fly rod, because that would be like climbing Mount Everest with neither oxygen nor campons. Instead, I opted for a jig tipped with shrimp. Casting that simple rig precisely to something swimming in chocolate-colored soup seemed like challenge enough. Asaro says the keys to sight fishing in the Ten Thousand Islands near Chokoloskee are timing the expedition to the tides and covering a lot of water. “You should be able to sight fish all day long,” he said. Asaro aims for high tides along beaches and oyster bars; mid-tides along mangrove shorelines and mud flags; and low tides in river mouths and passes. The theory is that fish will be easiest to see where water levels and geography leave them nowhere else to go. Asaro relies on Mike’s Yearly Tide Tables (available at Everglades City and Chokoloskee tackle shops for $2.50) to learn what the water is doing where. We exercised Option C (low tide in a river mouth) but were dismayed to find that days of high winds had churned the water into brown chalk. Still, Asaro said we’d be able to spot fish. He began to pole his Roughneck aluminum skiff along a mud bar dotted by sunken logs and rocks. small patch of light-brown mud. But then it moved — a snook! — and I tossed my shrimp-tipped jig about a foot to one side of its snout. The fish looked around frantically when it heard the 1/8-ounce lead head splash. But it didn’t flee in fright. I jerked the rod tip slightly and reeled up some slack line. The fish whirled around and pounced on my jig. It charged for a mangrove shoot, then lept a foot out of the water as I tried to reel. After a 10-minute struggle, I brought the estimated 8-pounder to boatSide to be photographed and released. The fish at Flamingo, 100 miles to the South, are easier for sight casting, the guide says, because abundant grass flats. The Chokoloskee area is surrounded by mud and oyster shell bars. “Because we don’t have the giant grass flat nursery like in Flamingo, there is nowhere for fish to be suspended so they can tail,” Asaro said. Fish are easiest to spot when their tails are sticking up from the surface during feeding. Asaro says sight fishing in the maze of mangrove islands south of Chokoloskee will become easier as summer calm replaces springtime gusts. Swirls and wakes of snook and redfish are easier to discern on the placid surrface. As waters warm, tarpon roll, trailing a long fin ray and flashing their silver scales in the bright sunlight.